My competition dog Jackaroo is a weird little dog. He absolutely loves running agility and all I have to do is say “Hey Jack, wanna jump, jump, jump?” and he is bouncing off the walls ready to go. I have had people stop me at show and tell me how much they love to watch him because he give himself over totally to the moment. I do love that about him despite the fact that’s what keeps outr qualifying rate low. But he is fun to run. Here is a short sequence in our training room so he is pretty under control. When he is not running agility he is a TV watching couch potato. I am always amazed at how he actually watches TV. 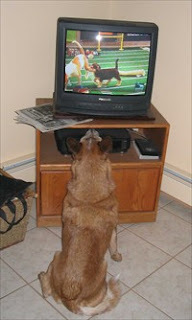 I have had people tell me dogs really can’t see what’s on TV but tell me what you think after seeing this picture. Do you think he is watching? He even has his favorite shows and commercials. Any commercial with a dog or cat or even just the music of that commercial, will bring him flying into the livingroom to watch. If its truly stimulating he will leap at the TV barking maniacally. This was animal Planet’s Pupper Bowl last year on during the super bowl. I kinda wish I’d watched this last Sunday instead of the real super Bowl. NO I AM NOT OVER IT YET! Oh man I am really wanting show season to start. I loved watching him in that video!! I do believe he is watcing TV – that is amazing! We have some friends that have 2 Pugs and one of their Pugs is like this – comes running to the TV when it hears animals. I’ve never seen many animals that really watch TV, but I do believe these certain ones do. I think they are particularly smart – dont you? Thanks for coming by Kellan. I am not very objective about my boy so I have to say he is extremely smart! He keeps me on my toes. I will definitely stop by again I really enjoy your blog. That is SO COOL that he watches TV! It’s true Jack is into full contact life!